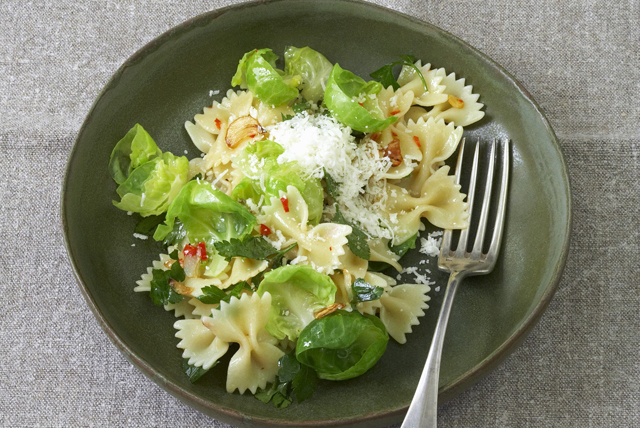 Simple and elegant, this easy-to-make pasta recipe is sure to become a new family favourite. Effortless to put together and delicious, this pasta dish features Brussels sprouts leaves seasoned with Parmesan cheese and garlic. Cook pasta in large saucepan as directed on package, omitting salt and adding Brussels sprouts leaves to the boiling water for the last 2 min. ; drain. Heat dressing in large skillet on medium heat. Add garlic; cook 2 min., stirring frequently. Add pasta mixture and parsley; mix lightly. Substitute fresh curly-leaf parsley or fresh basil leaves for the Italian parsley. Substitute 2 cups sliced trimmed Brussels sprouts for the Brussels sprouts leaves.